PLSCanonical implements the 2 blocks canonical PLS of the original Wold algorithm [Tenenhaus 1998] p.204, referred as PLS-C2A in [Wegelin 2000]. This class inherits from PLS with mode=”A” and deflation_mode=”canonical”, norm_y_weights=True and algorithm=”nipals”, but svd should provide similar results up to numerical errors. n_components : int, (default 2). The algorithm used to estimate the weights. It will be called n_components times, i.e. once for each iteration of the outer loop. Number of iterations of the NIPALS inner loop for each component. Not useful if the algorithm provided is “svd”. The residual matrix of Y (Yk+1) block is obtained by deflation on the current Y score. This performs a canonical symmetric version of the PLS regression. But slightly different than the CCA. This is mostly used for modeling. This implementation provides the same results that the “plspm” package provided in the R language (R-project), using the function plsca(X, Y). Results are equal or collinear with the function pls(..., mode = "canonical") of the “mixOmics” package. The difference relies in the fact that mixOmics implementation does not exactly implement the Wold algorithm since it does not normalize y_weights to one. 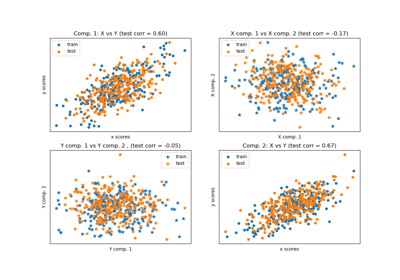 Training vectors, where n_samples is the number of samples and n_features is the number of predictors. Target vectors, where n_samples is the number of samples and n_targets is the number of response variables. x_scores if Y is not given, (x_scores, y_scores) otherwise.